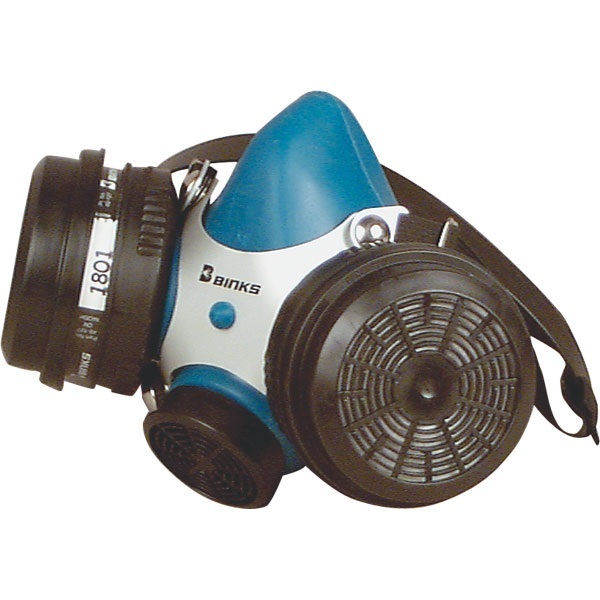 Binks Millennium 3000 Dual-Cartridge Paint Respirator is recommended for paint spraying and other particulate and/or organic vapor hazards. Soft silicone facepiece provides outstanding comfort, easy cleanup, and long life. Will not deteriorate after repeated washing and exposure to paints and solvents. Combination cradle/neck strap holds respirator in place without slipping. U.S. Government/NIOSH-approved for respiratory protection against certain organic vapors, oil-and non-oil-containing dusts, fumes, paint mists, lacquers, and enamels (having a time-weighted average not less than 0.05 milligrams per cubic meter or any combination thereof). Not for paints containing Di-isocyanates. Includes half mask with cradle/strap, two prefilters, two organic vapor cartridges, storage bag, and instructions. Made in USA. Medium size (fits most adults). This respirator will be used for both painting and spraying herbicides.This Millennium 3000 is another well made product by Binks. I have always like Binks respirators, paint spray guns and regulators they are all excellent quality and the Millennium 3000 fits right into that family of fine products. I also have an older model Binks respirator, assembly number 40-35028, which I've had for 40 years and it is still in excellent condition, I just had to replace the elastic straps for it. I bought the Millennium 3000 just because. Service & Delivery comments: I hadn't expected to receive my order until the following week after I ordered it but it was here in only a couple of days. I ordered these for use with my Millennium 3000 and my older Binks respirator, Assy.No. 40-35028, packaging and quality are as expected from Binks I am well satisfied with the prefilters. Service & Delivery comments: order received much sooner than expected, only couple of days before the order came. Packaging was sufficient to prevent damage to the product during shipment . I ordered this kit in hopes that it would work on my older model Binks Respirator. The assembly number on the older respirator is 40-35028. The kit works perfectly and I am well satisfied with it's material quality and workmanship. Service & Delivery comments: I hadn't expected to receive my order as quickly as I did. I was expecting to receive it the following week after I ordered it but it arrived in just a couple of days. everything in the box was well packaged to protect it during shipment.